As a suburb of Phoenix, AZ, the city of Chandler is a great area to live in. Families, singles, and retirees alike are drawn to the relaxed atmosphere of the area. In the planned community of Ocotillo, homes for sale are especially popular with buyers looking for a resort-quality environment. Several large national high-tech companies have working plants located in the immediate area, so commuting to work is easy for many residents. The Chandler Fashion Center is a modern mall that is located in close proximity to this neighborhood, so all of your shopping needs can be met conveniently. The San Tan Freeway, the Loop 101, and the Interstate 10 freeway all have easy access from the Ocotillo area, making commuting anywhere in the Phoenix metro area a breeze. No matter what type of property you are looking for, the Ocotillo area probably has it. If golf is important to you, then the golf real estate in Ocotillo could be intriguing. Many styles of golf properties are available. In addition to the links onsite, there are five different golf courses nearby. There is also plenty of waterfront real estate in Ocotillo, with its vast network of manmade lakes. Many homes are located directly on the water, offering you prime waterfront views. If privacy is your primary concern, gated homes for sale in Ocotillo are another real estate option that you might want to check out by using our Multiple Listing Service. 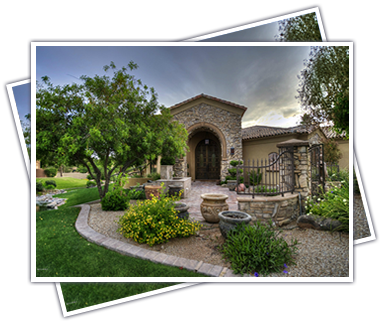 Luxury houses for sale in Ocotillo can be found on our MLS as well. Many of these impressive properties come with panoramic views, mountain views, or even lake views. If you’d rather be in the water, it is also possible to find great homes for sale with private pools in Ocotillo. For the environmentally conscious, eco-friendly properties in Ocotillo are plentiful. You can easily find a comfortable home that is also kind to the environment in this neighborhood. To take advantage of all the community has to offer, consider Ocotillo condos for sale. These are perfect for those that want their own home without a lot of worry. Some condos are right on the waterfront or even directly on a golf course. Both one- and two-level units are available. Similarly, renters can enjoy living in a home without having to be concerned about home ownership by choosing to live in Ocotillo rental homes. Let our MLS assist you in your search. No matter where you are in life, there’s an Ocotillo home for sale for you!